University of Nottingham > Blogs > Sustainable Nottingham > Students > No Flush! 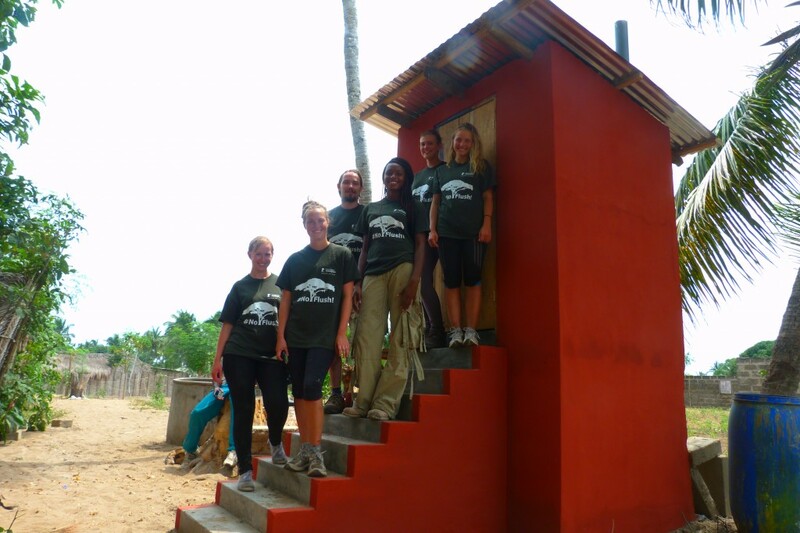 Joanna Stanyard, a civil engineering student, shares her experiences of working on an eco-sanitation project in Ghana. During the summer break, a team of three engineering and three nursing students travelled to the Volta region of Ghana as part of the NoFlush! Team. The group was put together thanks to funding from the University’s Cascade fund and support from nursing lecturer Dr Linda East. The project was set up in support of the Ghanaian NGO, Dream Big Ghana (DBG), and aimed to provide research that they could use to attract further funding and government support. DBG works closely within the rural community of Dzita, on the Ghanaian coast; one of their major schemes is to construct compost toilets for families within the nearby villages. Sanitation is a major issue faced by Ghanaian citizens with the access to improved sanitation in the country being recorded at levels as low as 13%. The group travelled to Ghana with the hope of gaining an insight into sanitation and barriers to development in this area, as well as to construct one of DBG’s compost toilets. The compost toilet was chosen by DBG as a suitable option for the alleviation of sanitation demand due to its sustainable credentials and use of appropriate technology. The toilets, once in use, are very low tech – well really no tech at all; they work on an alternating chamber system with a tray in between to drain off the urine. This system allows for the urine and faeces to be separated and then for the faeces to be left in the chamber for 8 months in order to compost. This high quality compost can then be used on the nearby farms (the main trade of the area). The construction of the toilets involves mainly sand and water sourced from the site combined with a relatively small amount of cement, with one of the main resources being labour – something the group will testify to! This simple solution offers a clean, smell free and safe alternative to public defecation. We hope that our research, which involved surveying the community and interviewing relevant stakeholders such as health care workers and politicians, will provide a useful document for Dream Big Ghana in their quest to gain full government backing out in Ghana and to become a registered charity here in the UK. For now, Dream Big wants to remain working in the local Dzita community retaining its close relationship with the local people, but we hope that other work similar to this could be established throughout the nation. For more information about the trip and work of NoFlush please take a look at our blog.